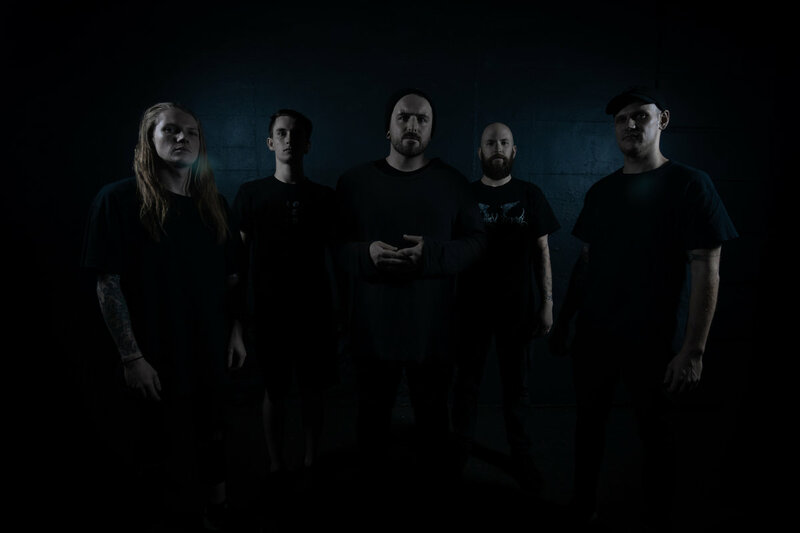 ZEOLITE - Release Brutal New Single/Video "Despised"
Melbourne's Zeolite are squarely targeting religion and its effects on society and those who they deem to be 'despicable.' They are releasing their new single 'Despised' into the world on Friday March 20 - and the message couldn't be more clear. In this political and religious climate, this single and video states boldly and definitively - Religion is a cancer on the human race. Despised' will be available at all digital stores and streaming platforms - and can be pre-saved here. The lyrics in 'Despised' very clearly criticise the Church and their treatment of the very people they swear they have vowed to protect and care for. Vocalist Fraser Mainwaring spoke about the lyrics of the song. "Lyrically, we talk about the 'Despised', but from the standpoint that the religion despises those with a free mind. For example, the lyrics: "We are the ones you despise" refers to the 'enlightened' whom they view as "the filth from under the dirt"." Patrick Haas discussed the videoclip - "The clip takes a slightly different stance of the situation, where we are drawing parallels between religion and cult. Basically if you bring the degrees of separation down to zero, you see they are one and the same. Also, both allow those in positions of power in these institutions to manipulate followers into committing horrible, abhorrent acts, and also to hide behind these institutions to justify and shield their own actions, and motives." They are also taking the new track out on the road on The Death Cult Tour in May 2019 alongside Xenobiotic. Friday 17 May sees both bands kick off the tour in Melbourne at Stay Gold, then on to Enigma Bar in Adelaide Saturday 18 May, Friday 24 May in Brisbane at The Brightside, Canberra at Transit Bar, and finishing in Sydney on Sunday 26 May at Frankie's Pizza. Tickets are on sale now - hit facebook.com/GozerBookings for details. 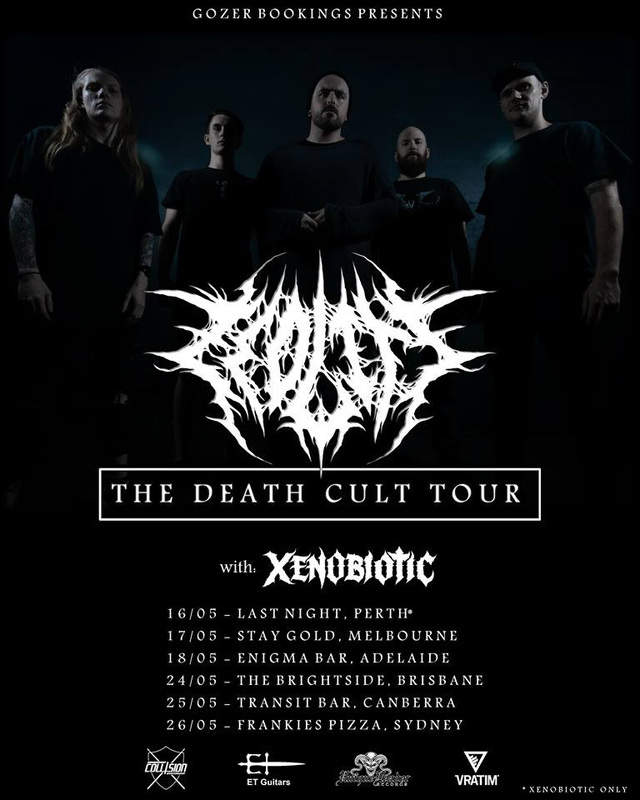 Since their inception in 2014, Zeolite has established and built themselves as ones of the premier Death Metal outfits in Australia - garnering 5-star praise from triple j The Racket's Lochlan Watt, Hysteria Mag stating that "...if ever you wanted to self-induce whiplash with some windmilling of your fine locks, look no further than Melbourne metallers Zeolite", and The Circle Pit likening listening to the band to "...receiving a good kick to the teeth. Don’t get me wrong now. As far as kicks to the teeth go, this one is actually quite pleasurable. Something like taking a fuzzy slipper to a mouth guard following a large dose of morphine." Since the release of Zeolite's self-titled debut effort and their sophomore release Sermones Mortis, Zeolite have been relentlessly and tirelessly working to give Australia a taste of their unique, diabolically heavy, sonic onslaught. They have garnered support slots for acts such as Psycroptic, Goatwhore, Archspire, Chelsea Grin, Northlane, Ne Obliviscaris, Boris the Blade, the main support slot for The Black Dahlia Murder and Aborted's most recent run across Australia, and performed at notorious festivals including Blacken Open Air, Dead of Winter Festival, Falls Festival and Metal Fusion. Both of their 2018 singles "Ruination" and "Plutocracy" found themselves in The Faction's Hardest 100 of 2018, voted by fans. Zeolite are Fraser Mainwaring (Vocals), Patrick Haas (Guitars), RS Frost (Bass), Grant McGuinness (Guitars) and Elias Kalaitzakias (Drums).